In a small room with a cracker in one hand and a small glass of grape juice in the other, I silently reflected on their meaning. “Do this in remembrance of me,” Jesus said. Many times, I have received communion and held these tangible elements representing His death. I waited for personal revelation of the implications of the cross: of Jesus’ death, burial and resurrection. God still speaks. I “hear” Him mostly when reading the Bible, at times through dreams or visions, and often with thoughts I know are not my own. Of course, everything is weighed against the truth of scripture. In a vision, suddenly Jesus (the Son of God not the glorified Christ) took me by the hand. Together we quickly and purposefully rushed past multitudes standing by their tents. It seemed like perhaps the encampment of God’s people in the wilderness. We approached what I knew to be the Old Testament tabernacle but without curtains to contain or divide it. There were no busy priest performing sacrifices or tending to the required rituals and requirements. Past the Brazen Altar and the Laver He took me. Past the Golden Lampstand and the Table of Shewbread we went. There was no need to stop! Now as a New Testament believer, I knew Jesus had fulfilled every requirement of the Law. Together we skirted the Altar of Incense and entered the Holy Place. A thick cloud of glory filled the area, circling and swirling. Jesus’ pace did not slow. A millisecond of panic gripped me as He let go of my hand. I was engulfed by the cloud. I was lost, without body or identity; nothing of me existed in the Presence of Holy God. I an instant I was completely inhabited by God. I was “in” Him, in His glory. His Presence “consumed” me. As I looked back toward Jesus, He was the embodiment of unconfined, unrestrained joy. In that moment, I realized this is part of why He died. “For the joy set before Him!” Jesus’ greatest joy is to bring all who believe in Him to the Father with shameless audacity! The “oneness” humanity once had in the garden completely restored! Access no longer denied with Father, Son and Holy Spirit! A unity that goes beyond humanity and reaches beyond comprehension! 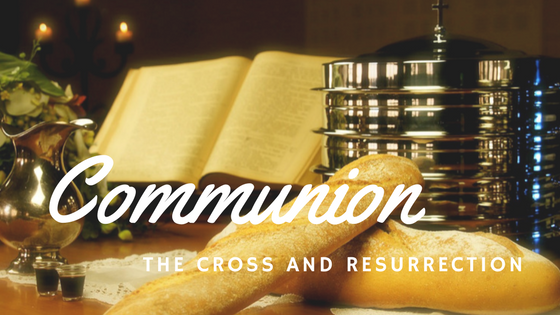 Communion, a common union! I stepped out of the glory toward Jesus, The Bridegroom, as I glanced downward. I stood in shock and amazement! My garments radiated gold and even my skin was dusted with it. Just as the Son’s joy is to bring us to the Father, the Father’s joy is to prepare us for the Son – a bride worthy of the bridegroom. Jesus’ enthusiasm and love surpasses our understanding or even our confusion! He is ecstatic! Jesus is not coming back for a weak unprepared bride, but one adorned and ready! It has nothing to do with us; it has everything to do with the finished work of the cross. In my right hand was an abnormally large golden sword. It was fully my height and heavier than I could lift on my own, let alone wield! It is the sword of mercy and grace. Jesus arose from the grave with all authority and power! What is rightfully His, He lavishly gives to His bride! Here in Him alone, we receive mercy! Here, we find grace! Every need is met! My needs, in comparison to many others, are small indeed. Yet, in all honestly, I struggle with personal “heavy” things of life. Joy is not always spontaneous or overflowing, nor is victory obvious! I am contending, prayerfully war, for what Christ has attained. Today I need the reminder of communion, the emblems of His death and resurrection. Drawing on the exuberant joy that originates and emanates from Him, I wait. Grasping tightly the sword I cannot wield on my own and did not merit by my efforts I take a stand, until like another warrior it is froze to my hand. I rest undone yet completely united in Him through His death and resurrection. Jesus has each of us by the hand, leading us to places we cannot, could not and would not go on our own. We live in Him; He lives in us! As we celebrate the Easter season, and each time we participate in communion, may we remember we have received mercy and found grace. If this resonates with you, but you don’t know Jesus personally, today is an excellent opportunity to enter into a relationship with Him. Jesus did all the work! Do you know for sure that you will go to heaven when you die? You can. There is a problem! God is holy. Only those without sin can come to Him; everyone sins. The solution to man’s greatest problem of sin is in Jesus Christ. God sent His Son Jesus to pay for our sin and make us holy before God. and give my your life. be Lord of my life. Welcome into the family of God! If you don’t already have a bible, find one and begin reading in the book of John. It is helpful to join a local church where you will be encouraged and supported in your new walk of faith. An exciting chapter of your life has just begun. Congratulations! ← Lead and Follow! Who is in the Lead?